This Getaway Poncho Knit Pattern is on my “make list” for fall and I am sure it will become a staple in my wardrobe all winter long. 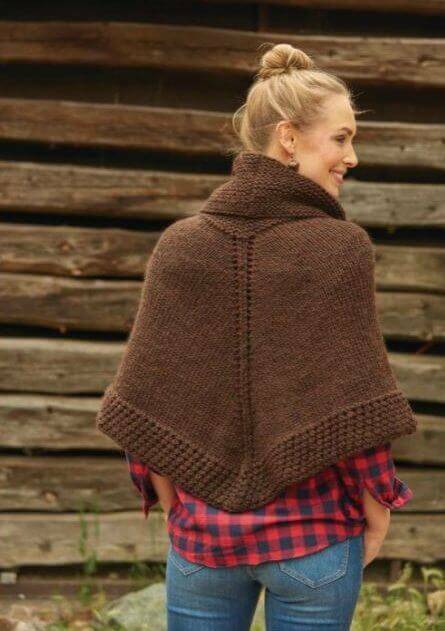 The Getaway Poncho was designed by Melissa LaBarre and is one of the many gorgeous knits you will find in the new release Weekend Wraps by Cecily Glowik MacDonald and Melissa LaBarre. A huge thank you to F+W Media, Inc. for sharing this pattern with us! Excerpted from Weekend Wraps Copyright © 2016 by Cecily Glowik MacDonald and Melissa LaBarre and published by F+W Media, Inc. Used by permission of the publisher. All rights reserved. Photos courtesy of Donald Scott. 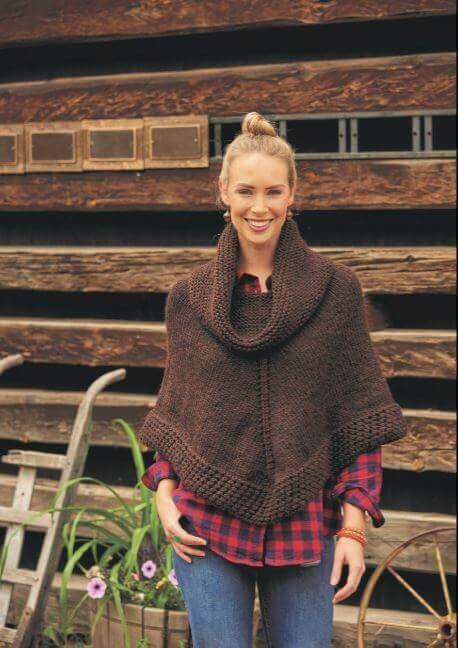 This sumptuous poncho is a great cover-up on a crisp fall weekend away. 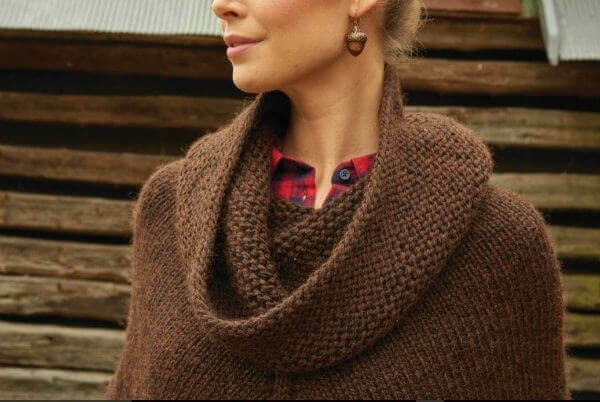 Knit from the top down in a bulky yarn with a big garter-stitch cowl and a stockinette-stitch body, it’s easy enough to be a relaxing and quick knit. The addition of a simple eyelet pattern at the bottom keeps it interesting. Top of cowl circumference: 32″ (81.5 cm). Neck circumference: 26″ (66 cm). Bottom body circumference: 64″ (162.5 cm). Length, from cowl along center front: 23″ (58.5 cm). Shown here: Berocco Peruvia Quick (100% wool; 103 yd [94 m]/3 ½ oz [100 g]): #9152 saddle brown, 8 skeins. Size U.S. 10 ½ (6.5 mm): 24″ (60 cm) and 32″ (80 cm) circular (cir). Adjust needle size if necessary to obtain the correct gauge. 12 sts and 17 rnds = 4″ (10 cm) in St st.
12 sts and 22 rnds = 4″ (10 cm) in garter st.
Poncho begins at cowl neck and is worked in garter stitch with two decrease rounds to the neck. The body is then worked in stockinette stitch, shaped with yarnover increases along the center front and back and finished with a garter eyelet trim. Rep Rnds 1 and 2 for garter st worked in the rnd. With shorter cir needle, CO 98 sts. Place marker (pm) for beg of rnd, and join for working in rnds, being careful not to twist sts. Work in garter st until piece measures 8″ (20.5 cm) from CO edge, ending with a purl rnd. Dec rnd: K3, k2tog, *k8, k2tog; rep from * to last 3 sts, k3—88 sts rem. Cont even until piece measures 10″ (25.5 cm) from CO edge, ending with a purl rnd. Dec rnd: K2, k2tog, *k7, k2tog; rep from * to last 3 sts, k3—78 sts rem. Cont even until piece measures 12″ (30.5 cm) from CO edge, ending with a purl rnd. Set-up rnd: K39, pm for center front, knit to end. Change to longer cir needle when there are too many sts to work comfortably on shorter cir needle. Inc rnd: K1, yo, knit to 1 st before m, yo, k1, sl m, k1, yo, work to last st, yo, k1—4 sts inc’d. Rep last 2 rnds 33 more times, then rep inc rnd once more— 218 sts. 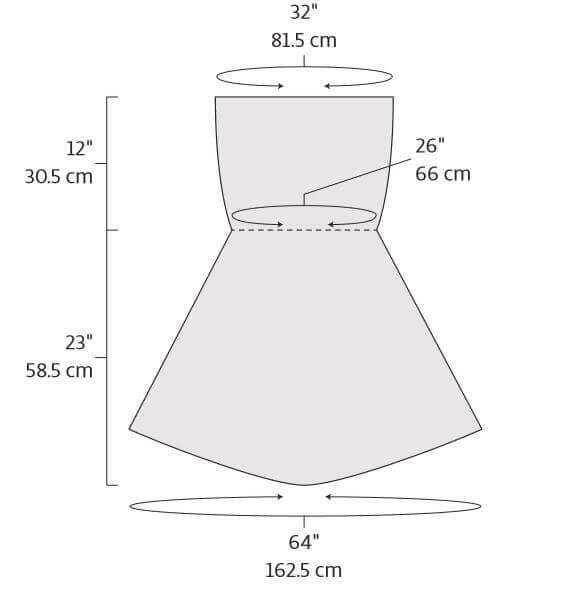 Piece should measure about 20″ (51 cm) from cowl along center front. Rnd 2: *Yo, k2tog; rep from * around. Rep last 2 rnds 6 more times. Weave in all ends. Block piece to finished measurements. Be kind and Just use the pattern she provided for free as a RAK from your computer ir phone and save a tree and the ink. Just a suggestion – INK is EXPENSIVE! I don’t need to be printing out your pattern and end up with page5 being a color ad for Chick-Fil-A………not happy! I have a print friendly button at the top of each post where you can easily pick and choose which parts to print. I hope the book also has crochet patterns. I’m not sure how your giveaway works. I’d love to receive a copy. I’m impressed by your creativity. Congratulations on you studies & especially your new career choice. Your two joys are so cute.